This weekend I had the pleasure of teaching my Stems and Stones pattern (along with a foolproof method for sewing snowball corners without drawing lines!) to the Courthouse Quilters Guild just outside of Nashville, TN. It was so much fun to see all of the different interpretations of the pattern, from more muted colors, to seasonal fabrics, to vibrant batiks with a black background. One quilter is using Kate Spain's Cuzco collection with a teal background, and I can't wait to see it all finished! 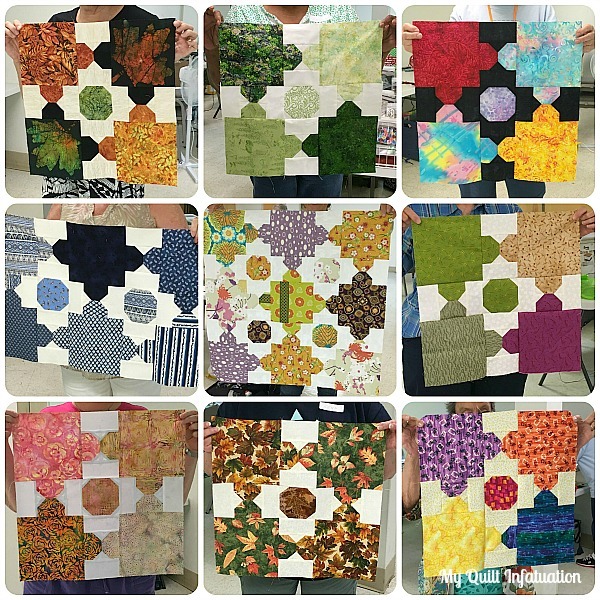 I didn't get a photo of everyone's fabric choices, as several quilters in the class opted to make a larger sized quilt. Since they wanted to be sure that they had plenty of flexibility in their layouts and had a good grasp on the design of the pattern, they opted to work on individual block components during the class, rather than finishing a smaller section. I made everyone promise to send a photo to me when they put their quilts together, and I can't wait to see them start rolling in! It was such a joy to have the opportunity to laugh and visit with these fun ladies, and I'm super excited to know that I get to return there in August to be a part of another event. Love the variety! Sorry I didn't get a chance to come and say Hi. Spent the weekend altering vacation plans since the original scheme got flooded out in WV. Hope to see you in August. Lots of fun combinations! The black with the batiks is my favorite. Hope you get more pictures. It's always fun to see how everyone in a class interprets a pattern.